Greeting Hong Kong cinema with the award winning (Ng Man Tat for Best Supporting Actor) and still standing Andy Lau classic A Moment Of Romance from 1990, cut to a year later and Benny Chan's second feature Son On The Run sets itself up as a lazy echo of his debut. Lovers destined to be together, kept apart by class and the appearance of a motorbike... it's even embarrassing taking on the flick as we watch Max Mok and May Lo enjoy a bit of risky stuntwork with said motorbike. What it turns out to be for one half of a flick is a nicely understated, very small story about reconciliation but Chan kicks his tragic melodrama into high gear for his second half and the film loses much of its momentum. Attempting to build from a peak in the love story rather than telling it from the beginning, the Tsang Kan-Cheung/James Yuen penned script does a decent job of filling in gaps as we roll along. Basic setups of the families, especially the father figures are clinched and we get a look at how an actor like Ng Man-Tat can grate when he's supposed to. Playing the gambling, debt-ridden dad who takes any opportunity, even if it means betrayal to earn cash, his constant nose picking and generally loud behaviour is performed to an almost deadly, uncomfortable level. But for this initial half of the story, it can be argued Ng Man-Tat is successful because he gets a huge reaction from an audience. Max Mok has sincerity in his eyes and not naive youthful love as Lau Siu-Ming's character argues. You are on board with the story enough that you even put yourself in the shoes of Lau's Mr. Chang and you ask yourself if his view of shielding his daughter from a potentially bad financial future with Hung is in fact a logical choice for reality. Son On The Run definitely argues in a valid way that it is a meaningful romance to follow therefore, especially when the structure calls for Hung and May to see who they are in each others eyes when in adulthood. He grieves and definitely does not progress and the light appearing when May does again is akin to a lightning strike. Coming up to the surface is love, hate, a reprisal of something sinister (again the fathers) but also Benny Chan is wise to let us know, quite subtlety I might add, that it's a lack of communication present. Both Hung and May are too blame and both should really listen to the Aimee Mann song "Wise Up". They do not but they do wise up, Hung gets his act together as a talented stuntman and gets to take part in fatherhood, something he seems destined to do. 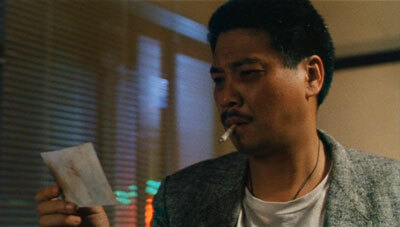 Then Benny Chan and company drops a bomb and the movie takes a trip down extreme Hong Kong melodrama-lane. A lane that isn't particularly pretty or noteworthy. Having faith in themselves to deliver again a la A Moment Of Romance, I applaud the attempt and understated was a key aspect to his prior film but by taking us onto a trip of personal tragedy, willing and unwilling sacrifice, Chan loses us. Not solely because we like the characters of Hung and May but because efforts within this downslide rings of NO sincerity. There's no grip on the story anymore, just the feeling of a downer done really sloppily. A bliss turning into unfair reality is a valid theme but not when played and done THIS big. Canto-pop, montages and drama being all too familiar, it affects character development of especially the fathers as well as it ventures into quick, convenient and unrealistic territory. All too familiar but not because of his classic debut, Benny Chan tries to add another similar spin by echoing something similar. The challenge was there, accepted but half a challenge accomplished is not a merit on your resume.